In just one hour of news this week there were reports of a massive earthquake in Nepal, violent riots in Baltimore, severe tornadoes in Texas, storms capsizing sailboats in Alabama, terrorists on trial, and volcanoes erupting in Chile. Today, Americans are marching in Maryland in support of charges brought against the policemen involved in the wrongful death of Freddie Gray, signaling a threshold of abuse in our country has reached its tipping point. With the Sun and Mars in Taurus, some aspects of life slowed down a bit in April, giving us a chance to reflect on these jarring, root chakra forces and security issues in our own lives. All month long, I’d been re-listening to A New Earth, by Eckhart Tolle, as I drove to work and back. First published in 2005, I was heartened by its vision and struck by how valuable a guidebook it remains. As the underworld of our collective subconscious rises before our eyes, it lends direction to another way. Frequency holders anchor the frequency of the new consciousness on this planet. They are here to generate consciousness through the activities of daily life through their interactions with others, as well as through just being. In this way, they endow the seemingly insignificant with profound meaning. Their task is to bring spacious stillness into this world by being absolutely present in whatever they do. There is consciousness and, therefore, quality in what they do, even the simplest task. Their purpose is to do everything in a sacred manner. As each human being is an integral part of the collective human consciousness, they affect the world much more deeply than is visible on the surface of their lives. A New Earth arises as more and more people discover that their main purpose in life is to bring the light of consciousness into this world and so use whatever they do as a vehicle for consciousness…..
…..You are still an ordinary human; what is extraordinary is what comes through you into this world. 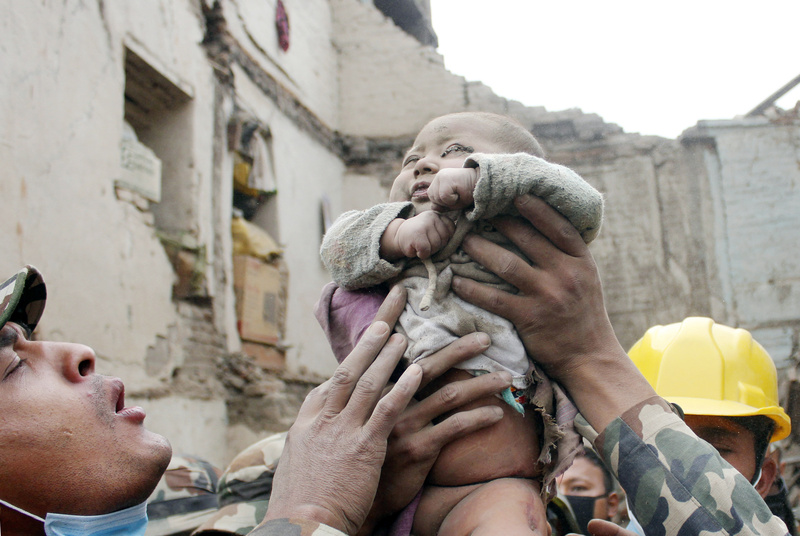 The collective prayers sent from around the world surely helped save many lives, including this four month old baby who was rescued after 22 hours buried in rubble. Though some are called to take the necessary outer action, those who held the consciousness of hope and faith also helped usher this baby into these arms, and every person praying was a demonstration of the possibility. Every experience we create reflects the consciousness we keep. Just as a consciousness of anger clearly creates disharmony, stress, and conflict…. the consciousness of love creates harmony, wellness, and peace. A consciousness of lack generates more lack, as a consciousness of abundance generates more abundance….and so it goes. The full moon in Scorpio this weekend will serve to further illuminate the unconscious aspects of ourselves that we are suppressing and projecting onto others. If we use the triggers as mirrors, we can recognize the consciousness we are embodying and engage our ability to expand our capacity, exercise new skills, and develop new resources. This entry was posted in Astrology, Awareness, Change, Consciousness, Coures in Miracles, Enlightenment, Healing, Inspiration, Love, Spirituality, Transformation and tagged Astrology, Awakening, Consciousness, Course in Miracles, Growth, Healing, Inspiration, Love, Spirituality, Transformation. Bookmark the permalink. Beautiful post, Nancy…it was a foundation shattering week. Thank you for the reminder to hold the consciousness of love and envision all those affected (including ourselves) blessed with the peace that transcends understanding.